For me, the physical and psychological body oscillates between vulnerability and resilience. The internal body as receptor is a filter for external world stimuli, and the eyes and ears acute channels for reception and communication. An embodiment of emotion, the tearing eye is also a regenerative mechanism for cleansing. 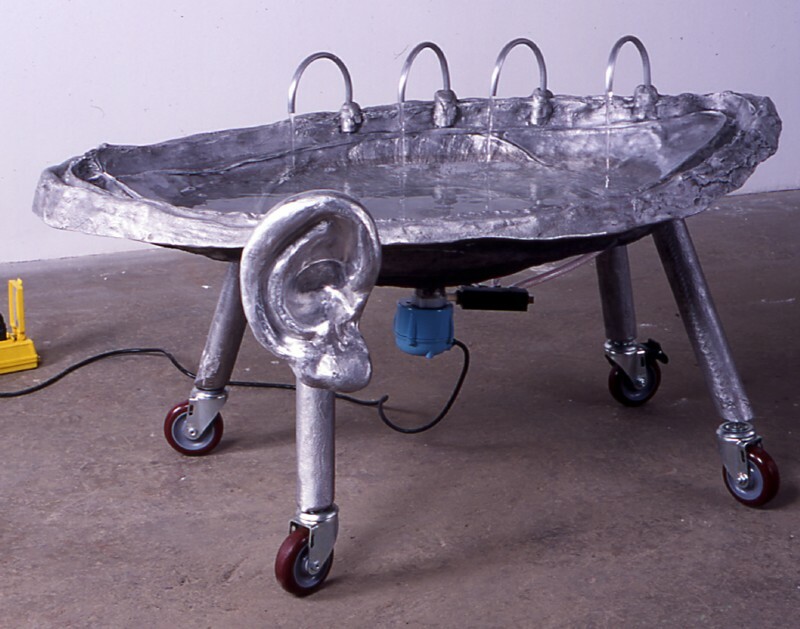 Hydroscope (sea of moisture), 2000 and Hygroscope (sea of vapors), 2000, oversized cast aluminum evocations of the human eye, reference water as both emotive and recuperative. Hygroscope alludes metaphorically to a kind of messy, uncontrolled weeping as its video loop records a bathroom sink overflowing, while the continual flow of the water fountain in Hydroscope amplifies the scale and sensation of the normally silent and unnoticed cleansing and lubrication of the eye. The piece is a representation of a large eye bath in the negative (with an ear appendage). The eye is filling with water, and draining away in the center of the eye and is continuously replenished by the abstracted eyelashes.